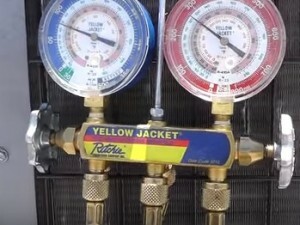 A gauge manifold set is one of the most important tools of the HVAC trade. Some of the current top brands are Yellow Jacket, Digi-cool, Imperial, Ritchie, Mastercool with many more manufactures. When it comes to HVAC and buying HVAC manifold gauges for most it is never as simple as buying one set and being done with it. Often multiple sets are carried around (or at least two) to be able to work on the different refrigerants in systems and oils used in refrigeration. There are a few HVAC technicians that carry only one set but most carry more as to not mix the different oils. Also sometimes you will come across a old unit that you just don’t want to put new gauges on. Everyone will have different opinion on the matter, and what it comes down to is what works for you to get the job done as efficiently as possible. This means getting to calls and quickly being able to troubleshoot and fix a problem. Here are the main refrigerants you will run into. If you carry multiple sets and use them with the correct refrigerant type then you never have to worry about cross contamination. If you are just starting out in the HVAC than you can get by with one HVAC manifold set, simply be sure to get a set that is made for R-22 and R-410a. So which Manifold Set is The Best for HVAC? This is a loaded question which no one will completely agree on. There are entire forum threads dedicated to arguing what the best brand and which set of HVAC gauges are best. Simple things such as using a single set or multiple sets with different refrigerants can often be contentious. The Best way to answer this question it to look at HVAC compatible gauges on Amazon or elsewhere and than read the reviews. Cross contamination is a myth. You do not need separate hoses/manifolds for this reason. You will not contaminate a system from using the same ones.